I hope that this message finds you all well. It has been a year since we met in Taipei at the 13th AFCMA Congress.I once again thank Sr.(Dr.) Lou and her staff members for the wonderful scientific programs and warm hospitality. At the Congress, as you may recall, we created two special Committees, Bioethics Committee and Medical Mission Committee, and asked Dr. Ian Snodgrass of Singapore, and Drs. John Lee of Singapore and Freddie Loh to take care the Committees. As you can find from our Federation website, http://www.afcma.blogspot.com/, these two Committees have already done some work and the immediate response to the Tsunami disaster in Indonesia is one good example of the Medical Mission Committee’s work. Using this opportunity, I would like to thank Drs. John Lee and Freddie Loh once again for their hard work, and thank those member organizations that actively participated in Tsunami refief project. Speaking of the Federation website, I must tell you that we owe so much to Dr. KY Chong, one of our three vice-presidents from Malaysia. I am sure that all of you will join me in thanking Dr. Chong for his personal sacrifice for the Federation website. I am glad to tell you that I have been able to meet some of you in person during the last year. In December last year, I visited Singapore to attend a meeting on medical education and had a pleasant meeting with Drs. Lee and Snodgrass, and in June this year I visited Bangkok for a WHO meeting and met with Dr. Akaraskul. In August, I once again visited Taiwan for a meeting of Catholic universities and colleges in Asia and met with Sr. Lou.In September, Dr. Kurniawan, the president of the Indonesian Catholic medical association visited Seoul for an international pediatrics meeting and we had breakfast together. I will be going to Manila early next month for another WHO regional meeting, and I will certainly try to meet with Dr. Jocelyn, the president of the Catholic doctors association of Philippines. Now, I have two announcements to make. The first thing is about the 2006 World Congress of the International Federation of Catholic Medical Associations scheduled to be held on May 11-14, 2006 in Barcelona, Spain. I know that it is quite costly for you to travel to Spain, but I do hope to meet you in Barcelona next year. I want you to visit the Congress website, http://www.fiamcbarcelona2006.org, and plan ahead to attend the Congress. 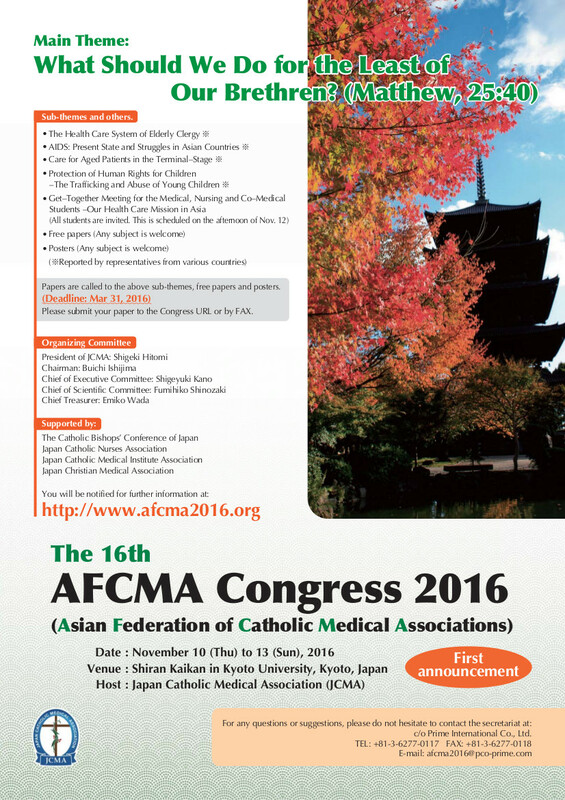 Secondly, I plan to publish an AFCMA Directory next year. This Directory will contain information on the national organization, and some statistics on population and country, Catholic church and church healthcare facilities and manpower. With regards to this project, I will send you a small survey form early next year.